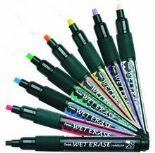 Pentel Wet Erase Chalk Marker pens can be used on lots of surfaces. They can be used on mirrors, windows, chalkboard labels, slate, stone, chalkboards and any non porous surface. They can easily be removed off most hard surfaces with a wet cloth however like all waterproof markers, chalkboards and blackboards may require a specialist chalkboard cleaner.